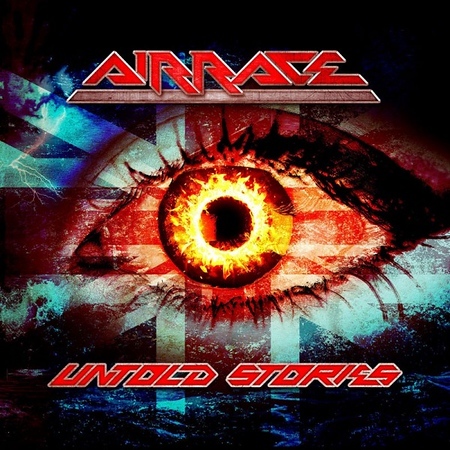 “Untold Stories” is the third album to be released by Airrace, the band that originated in the 80’s and which is probably best known for the involvement of Jason Bonham. There was 27 years between the release of the band’s debut album in 1984 and their come-back album in 2011. Fans have only had to wait 7 years for the third album which was released on 10th August by Frontiers Music. The track “Summer Rain” was included on the Friday NI Rocks Show on 13th April and “Running Out of Time” is included on the Show on 17th August. Airrace was formed in 1982 by former More guitarist Laurie Mansworth. By the time the band recorded their debut album “Shaft of Light” in 1984, the line-up included Keith Murrell on vocals, Toby Sadler on keyboards, Jason Bonham on drums and Jim Reid on bass. The band split not long after and it wasn’t until the 25th anniversary of the release of “Shaft of Light” that Mansworth, Murrell, Bonham and Sadler reunited in 2009. This proved to be a short-lived reunion and by the time Frontiers released the album “Back To The Start” in 2011, the line-up featured Mansworth on lead guitar, Murrell on vocals, Reid on bass and new additions Simon Dawson on drums, Dean Howard on rhythm guitar and Chris Williams on bass. The release of “Untold Stories” ushers in a new era for the band, with Laurie Mansworth being the only musician to have worked on any of the previous albums. He is joined by Adam Payne on vocals, Rocky Newton on bass, Linda Kelsey Foster on keyboards and his son Dhani Mansworth from The Treatment on drums. Airrace and The Treatment will be touring together in late September.